Harvest Time: Spring into Saving Dog Hair! - Knit Your Dog! Home dog hair Harvest Time: Spring into Saving Dog Hair! Harvest Time: Spring into Saving Dog Hair! 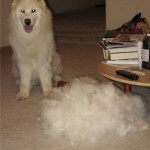 Spring for dog owners isn’t just about turning the clock forward; it’s about a lot of brushing. This is a great time, if not the best time to start saving dog hair! 1 Samoyed or 2? Thar the coat blows! For double-coated dogs, even the brief warm-up episodes in March that trigger the irises and daffodils to sprout are enough to make thick winter hair start falling out. Blowing coat happens twice a year. Unlike the usual loss of undercoat, the seasonal equinoxes trigger a massive loss of hair. In spring, the thick winter undercoat falls out and makes way for the lighter summer undercoat to grow in. Likewise, the lighter hair will start to fall out en masse in the fall when the first taste of cold air hits. This is a great time to start saving dog hair! Don’t be put off by the rising temperatures; this is harvest time. Fruits and veggies will come in the fall; brush that puppy now! I know, I know…everyone loves their Furminator. It takes off so much hair! Yes, it does take off hair. But it has a blade, and blades damage the hair shafts as they come off the dog. But…sheep get sheared, why can’t I just clip my dog’s coat? I hear this question a lot. The bottom line is this: dog hair is not the same as sheep hair. When viewed under a microscope, a hair shaft from a sheep has little toothy things all along the length of the shaft. Those toothy things, the barbs, are what allow the hair fibers to catch and hold onto each other in the spinning process. (It might also help to explain when some wool causes itching on the skin.) Dog hair shafts do not have barbs all along the shaft. Those little teeth only occur on the base of the hair shaft, near the skin. Hence, when dog hair is spun, while the fiber twists all the way up and down the shaft, it does not remain twisted after it is worked (knitted, woven, etc.). That’s why chiengora has a “halo“; and that halo is why wool from dogs is so much warmer than wool from sheep. Any blade edge can damage the hair shaft, and if those barbs are not intact, the wool can’t spin. So if I can’t use a Furminator, how do I get all that hair out of my pup??? My best suggestion is a rake. It’s not a perfect solution; it pulls out so much that little poofs tend to fly free. One must also be careful to rake gently, since undercoats can tangle and the rake will pull on those tangles. But it will get out a lot of shed. As an alternative, I also use the Untangler, a comb with rotating teeth that slips through hair more easily. It doesn’t remove as much shed at one time as a rake, but it does an admirable job, and Clarence prefers it by far on his more sensitive skin. So you have a mountain of fluff on the floor. It’s like you just adopted another dog. Now what? For storage, paper bags are best. Pack the hair loosely. Don’t pack hair tightly for any period of time longer than a week or so. Just as it can mat on your dog, it can mat in a bag. Fill the bag, bend the top of the bag over on itself, and use a binder clip to hold it shut. brushes, collect, grooming, harvest. Bookmark. Humanely Harvested: dog hair is NOT weird! About how much Hair will I need to collect for scarf? I have 3 Golden retrievers but I’ve always either brushed them or used a furminator on them. Now that I read your article I see that furminator Hair won’t spin. I’m sad now cuz I’ve neen collecting it for so long because I wanted to use some of the hair of 2 of my Golden’s that passed away but see also it needs to be spun right away. Can I get enough hair that quickly that is needed for a scarf? First things first: it does not need to be spun right away. As long as it is stored loosely and kept safe from pests, dog hair can be stored indefinitely. As for how much is needed, that depends upon the dog or dogs and I cannot answer your question generally. Use the Contact button to pm for more information. Finally, hair that has been removed with a furminator can be spun, but it probably won’t be comfortable. Furminators use blades to create a static charge and that scrapes the hair shaft. It makes for prickly wool, which we do not recommend, especially for a scarf. Again, if you pm us, we can tell you more, but because this is an entirely customized process specific to your dogs’ hair, we can’t tell you anything for sure until we have handled your dogs’ hair. I hope that helps. I know you described it in your Harvesting video, but is there a particular slicker brush (brand / style) you recommend? Thank you! There is no particular brand that I recommend. I find that any slicker brush that does not lose teeth when brushing is acceptable. I prefer using brushes with softer grips; it’s just easier on my hands. Can you vote for 60 Second Docs? If you have followed Knit Your Dog for any amount of time, you no doubt saw our profile on 60 Second Docs Presents (featuring all three members of my beloved, dearly departed Shed Squad). Now, the documentary series, which has also featured many amazing subjects, has been nominated for The Webby Awards. I just voted in The Webby Awards People’s Voice Awards. You should too. The Coast Salish wool dog has been extinct for a little over a century. Excellent article. Thanks for sharing it. So sorry, Jeannie. I know he had a wonderful life with you and the others in the family. I am sure he left a huge hole in your heart. My sympathies, friend. Sending you healing thoughts. He lived an amazing life with you, as do all creatures fortunate enough to have you as their human. Being a rescue, he appreciated every day!!! Oh, my friend, you have loved one another well, you and your flock of furry defenders. They are rising as kites of the soul to tether you between this world and the next. To love and grow, to lose and love again, may healing come to your mourning heart. My heart aches for you. Love you. I am so sorry to hear that. We are going to miss him. I’m so sad. What a good boy he was. Sending you lots of hugs. We are so grateful he got to come in today. We didnt realize we were sending him off but nothing would have changed if we had. He inspired us and he was (is) loved. So sorry for your loss Agnes Monteith. I'm sure you have many fond memories of him! I'm so very sorry. There are no words. Wishing you comfort in any way that is possible <3 Take care. So sad to hear...Good Journey Shadow. The rest of the Shed Squad waits to rejoin you and get the band back together. Knit Your Dog shared a post. Jean Mikita Sashihara would Caspian allow this? Want to knit or crochet for a good cause? The Carolina Waterfowl Rescue Group is looking for people who can knit or crochet wildlife rescue nests for their baby birds. I would worry about their little toes and legs getting tangled in yarn and breaking a leg. Copyright © 2014-2019 Knit Your Dog, Inc. All rights reserved.